There was time when I could actually declare an appreciation towards modern commercialized music, whether Rock or Metal. However, after a while I realized that there is nothing better than those genres played in their true versions without being too cheesy or too much abiding to the demands of the public's majority that mostly seek the easiness of it all. Taking a listen to "It All Fades Away", the second album of the Portuguese group, SCAR FOR LIFE, made me realize that there is another way to enjoy this new modern commodity of commercial / Alternative Metal without feeling that the music is a slave to someone's biding. Right from the first tunes I was able to conclude that there is something more to this release beside the ability of being a catchy easy listener. There were moments where I felt that I was listening to the version of 3 DOORS DOWN that I so wanted to hear but never had a chance. 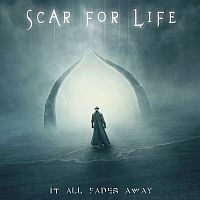 SCAR FOR LIFE showed their worth by maintaining an interesting line of power music to the side of capturing the right moments whether with the vocals, including on the choruses, melodic passages and heated solos. The band made a fine mix between the groovy and catchy elements of Alternative Rock / Metal while servicing it with aspects of Power / Heavy Metal. So as you might see, and hear, there is more than meets the ear. One of the things that virtually crazed me was the band's vocalist, Marco “Rez” Resende. I was rather shocked to read that he is not in the band anymore and I believe that the new guy replacing him, Leonel Silva,has to fill quite of a hefty pair of shoes. Rez is something else. He has such a powerful voice full of depth that will share recollections of Dio and Dickinson while sustaining a strong similarity to 3 DOORS DOWN’s vocalist Brad Arnold. Rez was one of the main reasons that I liked the album so much. Secondly, the band's musical abilities also helped the album reach its peak. The music wasn't that complex but rather flowing and moderately easy to comprehend. The lead sections were exciting; Alex played some fine licks that convulsed into some strong moments. I think that in general, SCAR FOR LIFE tried to open themselves to additional markets aside from the core of the genre. The tracklist seemed to be diverse, whether between up to date and old school music or whether between the straightforward chops and inner emotional states. Most of the songs are more than compelling as they run to opposite directions, between darkness and light. Through the midst of "It All Fades Away" the soul would probably consume a lot. Personally I favored tracks as the self-titled, "Lost", "Narcolepsy" and "Here Comes The Night". Through those superb songs, of course while not ignoring the additional ones, I sensed how diverse this band is and became a fan. These enchanting songs have powerful moments such as victorious choruses, passionate line of vocals, varied riffs and lead guitar licks that range from acoustic wonders through modern Rockers to head banging Metal trailblazers made of the best steel. I can’t also forget the streak of changing atmospheres that won't allow anyone stand aside and not join the menace. SCAR FOR LIFE took Metal and Rock and provided them with the signs of different time lines in order to stand them out of the rest. They did it with elegance and I salute them for their choices.